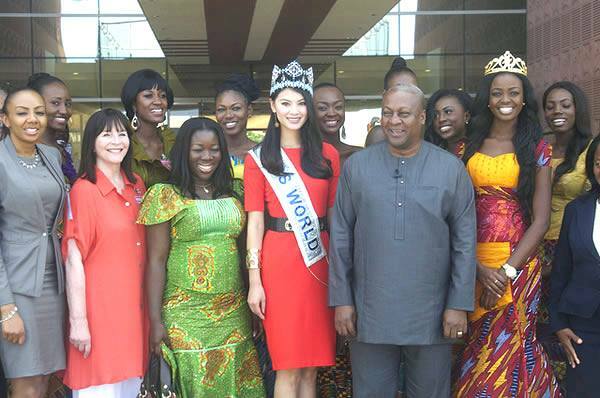 The Miss World delegation that are currently in Ghana for a Beauty With A Purpose charity mission paid a visit to Ghana's president, John Mahama, earlier this week. The delegation which included the reigning Miss World, Wenxia Yu from China, Miss World CEO Julia Morley, and the reigning Miss Ghana, the Miss Ghana 2013 delegates, and the license holder for Ghana were greeted by president before a photo call for the media. The Miss World delegation will attend tonight's Miss Ghana final before jetting out of the country tomorrow. Wenxia is just beaming here and might I say that Julia Morley is looking absolutely loving. She just looks younger and younger all the time. Ghana is going to be a fierce contender in Indonesia.